High-purity quartz sand has a wide range of applications in the high-tech industry. In the semiconductor industry, high-temperature thermal performance wafers can be made from molten quartz for high-temperature thermal stability with high temperature and thermal stability. In the communication industry, quartz glass produced from quartz sand is optical fiber and other optoelectronic devices. Basic materials. The hydrocyclone is a device for separating and removing substances such as heavier coarse-grained silt from sewage, and sometimes used for mud dewatering. It is divided into two types: pressure type hydro cyclone separator and gravity type. It is usually made of a circular column structure or metal tube. The water enters the tangential line from the upper part of the structure (or metal tube) by pressure or gravity. Under the action of centrifugal force, the coarse and heavy particulate matter is thrown to the wall and rotated downward to discharge together with the formed concentrated liquid. The smaller particulate matter is rotated to a certain extent and then discharged with the second upper vortex. The hydrocyclone is a high-efficiency grading, desliming equipment, which is widely used at home and abroad due to its simple structure, easy manufacture and large processing capacity. Its main disadvantage is that it consumes a lot of power and is seriously worn during high-pressure feeding. The use of new wear-resistant materials, such as cemented carbide, silicon carbide, etc., to make the grit and the wear-resistant parts of the ore can partially solve this problem. In the process of grading and purifying quartz sand, the water cyclone is mainly used for grinding classification, sorting, concentration and dehydration. The hydrocyclone can be used for the classification of the coarse sand and overflow of the ball mill, as well as the pre-grading before the grinding operation. The obtained process index is almost the same as that of the mechanical classifier, and can basically replace the classifier work. Especially when the concentration of the slurry is large and the mechanical classifier cannot obtain a fine overflow, a hydrocyclone must be used. However, the hydrocyclone wears faster during the working process, and the lining needs to be replaced frequently, resulting in high equipment cost. If a high wear-resistant material is used as the lining, this problem can be solved. In some processes, due to the low concentration of the slurry, the design requirements are not met, and a cyclone is required for concentration treatment. In the wet beneficiation process, after the raw ore is treated by the mashing process, quartz sand or impurities may be present in the slurry, so sand removal and impurity removal are prerequisites for the beneficiation process. Due to the different nature of the ore, sometimes a cyclone with different specifications may be used in combination to meet the process requirements. Fine sand of fewer than 37 microns in tailings cannot be used as a material for tailings dam construction. Therefore, when using tailings to build dams, it must be classified by the cyclone, coarse grades are left near the dam, and fine grades are tailed. The tail of the mine is flowing. At present, the tailings filling scheme is generally pre-concentrated and classified by a cyclone, and then dewatered by a filter to achieve the best effect. 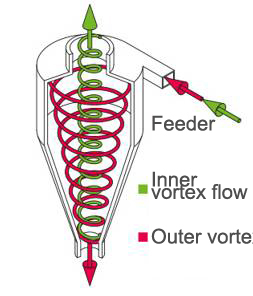 The hydrocyclone is not limited to the above operations, it can also be used to solve many other problems in the concentrator. In addition, the cyclone can be used not only in the beneficiation industry, but also in the paper industry, construction, chemical industry and other industrial sectors. JXSC Chinese hydrocyclone manufacturer provides types of hydrocyclones for dewatering in the mineral processing, contact us to know the latest price.